In under two years, Interior Secretary Ryan Zinke has inflicted staggering damage on our environment, our coasts, and our iconic public lands. He’s spearheading the drive to hand over the Bears Ears and Grand Staircase-Escalante National Monuments to the fossil fuel industry, repealing critical climate-busting methane protections, auctioning off America’s coastlines for dangerous offshore drilling, and gutting critical wildlife protections under the Endangered Species Act. On top of all that, he’s now being investigated for at least 17 ethics violations, including a reported Department of Justice investigation for using his office for personal gain. Enough is enough. It’s time to stand up for our planet. Tell President Trump that he must fire Interior Secretary Ryan Zinke immediately. In under two years, Interior Secretary Ryan Zinke has inflicted staggering damage on our environment, our coasts, and our iconic public lands. On top of all that, he’s now under investigation for at least 17 ethics violations. Enough is enough. It’s time to stand up for our planet. Tell President Trump that he must fire Interior Secretary Ryan Zinke immediately. Dear President Trump: I urge you to fire Interior Secretary Ryan Zinke immediately. The Interior Secretary has an important responsibility to protect America's public lands and wildlife, but instead Zinke has focused his efforts on dismantling protections for our national monuments, selling out our public lands to corporate polluters, opening the Arctic National Wildlife Refuge to industrial oil drilling, and auctioning off America's coastline for oil and gas drilling. 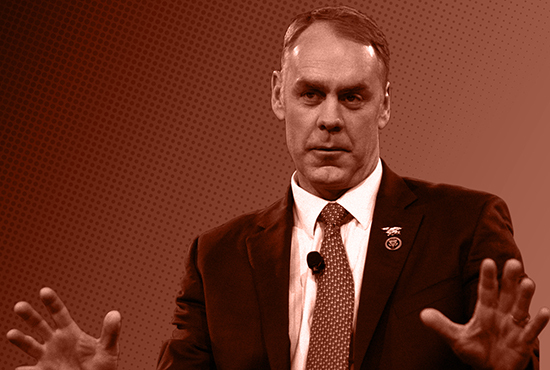 On top of all that, Secretary Zinke is facing mounting ethics investigations into, among other things, his financial dealings and whether he improperly benefited from a Montana development deal linked to the oil and gas company Halliburton. As president of the United States, you have an obligation to defend the American people by firing any member of your staff who is not fulfilling the responsibilities of the office to which he was elected. I urge you to act in the best interests of our nation and fire Zinke immediately. Thank you.